We offer a full range of Davis Islands property management services tailored to you as an investor, homeowner, or landlord. We have an extensive portfolio of single family homes, townhouses, condos, and apartments in the Davis Islands area. 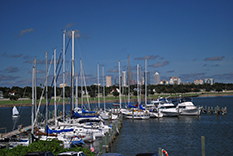 Conveniently located just off downtown Tampa, Davis Islands was built upon two man-made islands atop two small natural islands formerly known as "Little Grassy Key" and "Big Grassy Key" at the mouth of the Hillsborough River. The islands were built from mud dredged from the bottom of Tampa Bay in the 1920s undertaken at the height of the Florida Land Boom by developer and Tampa native D. P. Davis. Davis purchased the dredged land for $350,000. He planned a resort community with three hotels, nine-hole golf course, airport, and swimming pool. The streets were named for famous international bodies of water in somewhat alphabetical order starting at the north end of the island. D.P. Davis then sold 306 of the original lots for $1,683,582. The development stalled when the Florida land boom of the early 1920s wound down, and Davis was mysteriously lost at sea while making a transatlantic voyage in October 1926. Many of the original Mediterranean-style structures are still standing and have received national historic designation. Today Davis Islands is comprised of a delightful mix of residential, recreational and commercial/retail areas. Residences are an assortment of architectural styles, giving this highly-sought-after community a unique eclectic charm. Copyright © CENTURY 21 Fisher & Associates. All Rights Reserved. CENTURY 21® and the CENTURY 21 Logo are registered service marks owned by Century 21 Real Estate LLC. Davis Islands Realty, Inc. fully supports the principles of the Fair Housing Act and the Equal Opportunity Act. Each franchise is independently owned and operated. Any services or products provided by independently owned and operated franchisees are not provided by, affiliated with or related to Century 21 Real Estate LLC nor any of its affiliated companies.